I hope you agree that this is a nice trade-off: keep the code in Application Express really simple, move the complexity to the backend. Another common usage of table functions is to stream data directly from one process or transformation, to the next process without intermediate staging. Hence, a table function used in this way is called a streaming table function. As you might be able to tell from the reference to transformation above, this technique is most often used in data warehouses. Insert them into the ticker table. And I want to do it entirely in a single SQL statement. But please assume for the sake of my blog post that the transformation is way more complex. In fact, let's be clear: the actual implementation of the transformation (table) function is obviously going to be application specific in the extreme. So I keep my transformation logic very simple and will zoom in on the key steps that you would take for whatever real-world transformation you need to implement. So a collection of tickertypeset is what the function will be returning. But what will I pass into the function? 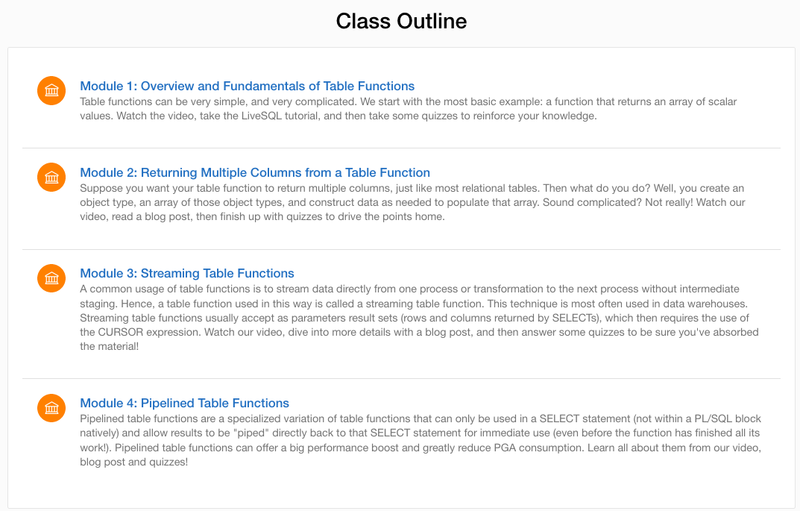 When you are building a streaming table function, that generally means that you are feeding into the function the result set of a SELECT statement. Now, you cannot pass a SELECT statement itself as an argument to a function. The body of function fetches N rows at a time, and then converts each of those single stocktable rows into two object types instances, each of which are added to the retval nested table. The code in purple is my very specific transformation logic. Yours will vary greatly and almost certainly be lots more complicated. But what if you are transforming lots and lots and LOTS of data, and you've invested in the Parallel Query option to speed things up? And that, dear reader, is the subject of my next post in this series on table functions.